Why are my Revaluate Scores Not Showing Hot Movers? Revaluate can integrate with your Follow Up Boss account to pull your contacts in and begin monitoring their scores. To do this, go to the import page and then click the "Import Follow Up Boss Contacts" button. You'll need to obtain your API key from Follow Up Boss. Once you have that, enter it into the box that popped up from the previous step. We'll sync your Follow Up Boss contacts once per week so any new contacts that get added to your Follow Up Boss account will be pulled into Revaluate and monitored. On the settings page you can specify a list of tags to exclude from syncing. That way if you have tagged all your agents or vendors in Follow Up Boss, Revaluate won't import them. 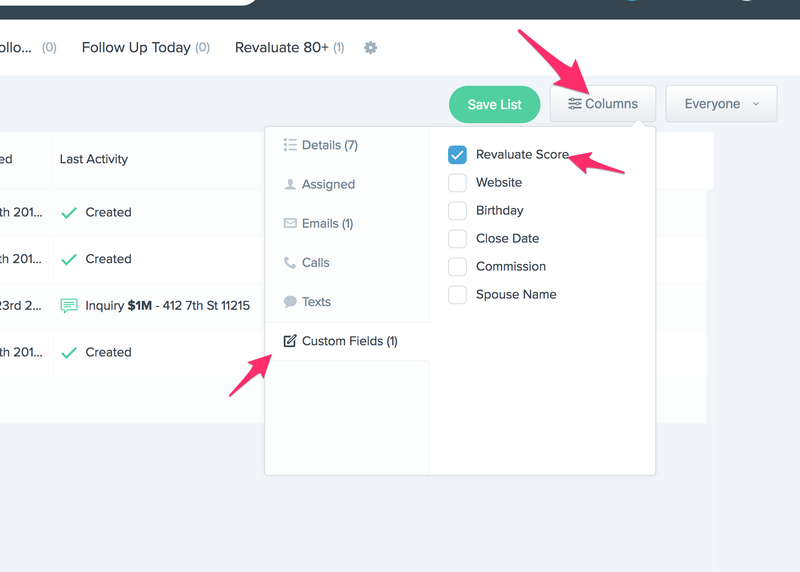 Revaluate also creates a new custom field inside your Follow Up Boss account called "Revaluate Score". We then push each contact's score into that field on a daily basis. You can then add that field to your lists and build reports and execute workflows for your likely movers.